After making Creamy Garlic Pasta for dinner last night, I took my kids to karate. When we came home, I opened the door and the entire house smelled like garlic. While I do love the taste of garlic, and my family did love dinner last night, I don't love my house smelling like garlic (or most dinners for that matter). 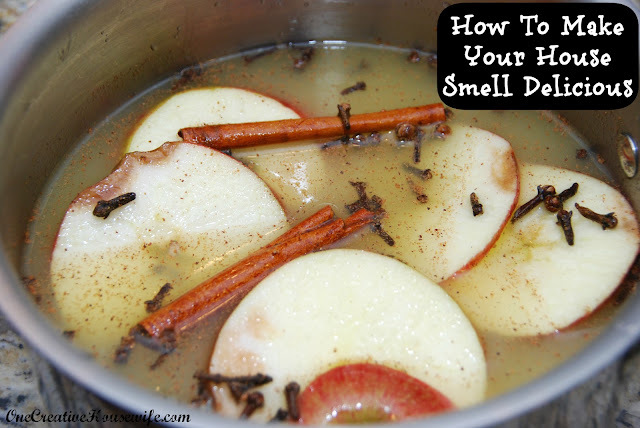 Since it is fall, I decided to go back to a favorite trick of mine that has never failed me when it comes to making my house smell good. It is a great mixture of fall ingredients that I simmer on the stove top. After about 15 minutes my entire house is filled with this lovely fall scent. 1. Place all the ingredients in a sauce pan, and bring it to a boil. 2. Then reduce the heat to low, and allow it simmer for as long as desired. ~As you can see, my apple wasn't in the greatest condition. It doesn't matter. I actually prefer using an apple we are less likely to eat any way. ~Make sure you don't let your pan boil dry. You can add more water as necessary. ~Just as when you are actually cooking something, do not leave it unattended. I'm sure this does smell awesome - I need to give it a try ... my house has a funk about it from being closed up during the hot summer months. Thanks for stopping by..I hope you like it!